Company Theatre is a community-run theatre organisation. NOVEMBER 2013 - What's Inside? Opening Night Special - Live Irish Music! LITTLE GEM opens on Saturday 16th November -See SPECIAL! Anyone with an Irish background is sure to love Little Gem. Anyone else will appreciate the passion of the writing in this award winning play that emerged from the Dublin Fringe Festival in 2008 and has been in continuous production ever since. 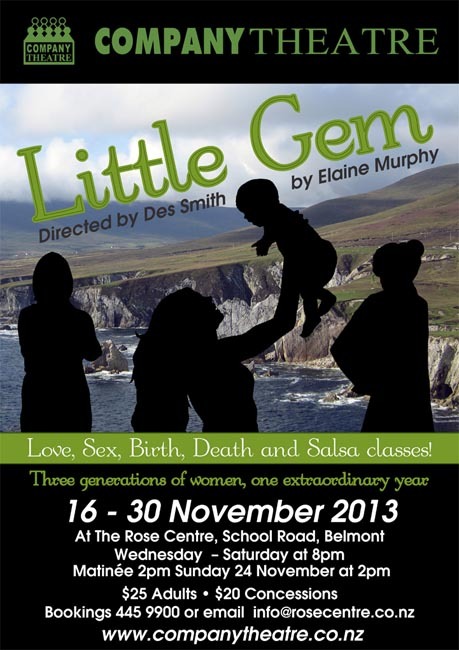 Little Gem is a return to Company Theatre for Director Des Smith, who is originally from County Maho, in Ireland. His first acting role in New Zealand, was in Company Theatre’s 2003 production of Alan Ayckbourn’s Tons Of Money, so to be directing here over 10 years later feels a bit like turning full circle. Little Gem tells the story of three generations of Irish women: daughter, mother, and grandmother across one year in their lives, each from their own perspective. It is set in Dublin, today. Most of the play is done through monologue but with 163 lighting and sound cues - which have taken hours of work for our fantastic lighting designer Scott Thomas and Sound designer Terry Smith. The show has a lot to watch! There are two moving slide sequences, cleverly projected onto a set designed by David Blakey and built by a team of construction volunteers, headed by Phil Davis. On the back of the set is a hand painted mural - of an iconic bridge over the river Liffey in Dublin, by artist Annemarie Connors, from The Resurrection Workshop, Auckland. Three three talented actresses are: Orla McNeaney, Kirsty Hamilton and Jessica Walsh. She graduated from Toi Whakaari the New Zealand drama school in 1992. Since then she has played Grace in the New Zealand feature film Saving Grace amongst many other roles in film, TV, and theatre. She was the SGCNZ (Shakespeare Globe Centre of New Zealand) International Artistic Fellow alongside Rawiri Paratene at Shakespeare's Globe Theatre in London in 2007. She graduated from European Act, a three month acting and screen writing intensive in 2009 through the London Actor's Centre, RADA and the Paris International Centre for Performing Arts. She also has a Master’s Degree in Script Writing from Victoria University in Wellington and working towards a full time international careering as a screen writer/director. Orla is originally from County Armagh in Ireland and has been performing since she was 11 years old. She has a Degree in Acting from the University of Ulster, Magee, Ireland. In Ireland she featured in an Irish soap called ‘I Fought the Law', also in corporate video's and various short films 'Bug Coffee' and 'The Box'. After a 3 year break from acting to concentrate on her Marketing career, and a move to New Zealand, Orla is treading the boards in her first production here. Jessica is from Dublin and has been living in New Zealand for the past four years. In Ireland Jessica attended the Gaiety School of Acting in Cork for 2 years and performed numerous roles in plays and showcases. Once she heard there was an Irish play being done in Auckland she knew she was meant to be in the cast. She hopes the audience enjoys Little Gem as much as she enjoys performing it. There is an opening night special for Saturday 16th November. Tickets are just $20 and include LIVE IRISH MUSIC in the foyer before the show from Devonport musicians Greg and Linda Whitcombe. Our cash bar will be open as usual, but with Guinness available, as well as our quality Cooper's Creek wine by the glass. Please book early for this performance. RING Richard on 445.9900 to book your seat. We look forward to seeing you there! Enjoy a toe tapping reel from 7.30pm. Plenty of parking next to the Rose Centre. Season Dates for Little Gem are Wednesday - Saturdays at 8.00pm. 16 - 30 Nov. There is one matinee on Sunday 24th November at 2.00pm. The matinee is always popular. See the BOOKINGS page on the website for more information on dates and times. FOH VOLUNTEERS for the season of Little Gem 16 - 30 November. If you are a member of Company Theatre (or if not you can easily join on the night for $10) please email to be part of our Front of House Team. We welcome your assistance as Ushers, Programme Sellers or Bar Staff. Please email sherryede@hotmail.com, with a couple of dates during the season that you are available for, and which job you'd prefer. If you are interested in the position of Front of House Manager - please specify. Training will be given. We look forward to welcoming you to our team. We have a Volunteer's meet and greet evening. Not many slots left for this show - please email asap! An Ideal Husband by Oscar Wilde. 2.00pm in the new Company Room*, upstairs, at the back of The Rose Centre, School Road, Belmont. Steven has recently joined the Company Theatre committee. He has directed, acted and produced in New Zealand for around 20 years. He comes to Auckland after having lived in Wellington and Christchurch where he also studied his BA in drama, and Speech and Drama qualifications. He has just been elected to the National Executive of Theatre NZ. By day, he is a Senior Lecturer for Montessori Education through the AUT University. He is passionate about An Ideal Husband and believes its themes and issues have many parallels and relevance today. Political intrigue and dishonesty in politicians are issues that reappear in all periods of history - even local Auckland council elections! The Oscar Wilde dialogue is, as expected, extremely witty and amusing. This will be a rewarding production to be part of. For all casting and audition details - please go to our website, www.companytheatre.co.nz. Scripts can be sent quickly and easily to you, by email, from Richard at the Rose Centre, on info@rosecentre.co.nz or phone him on 445.9900. Just a note for our past members who have not been to visit us for a while, you will be delighted to see the new Company Theatre room, if you come to audition. We at last have our own rehearsal space - the exact same size as our stage. More details in a later newsletter - as it has not been officially opened yet, as it needs a couple more things to finish off before we can celebrate in style and thank some very special people whose generosity helped it come into being.